except for the dead look in his eyes. and who’s choosing his victims? 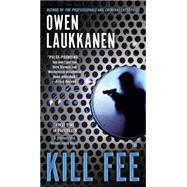 Owen Laukkanen’s first novel, The Professionals, was nominated for multiple honors, including the Anthony Award, Barry Award, Spinetingler Magazine Best Novel, New Voices Award, and International Thriller Writers’ Thriller Award for Best First Novel. His second Stevens and Windermere Novel is Criminal Enterprise.